I’m Leaving Lyft to Fix Politics. Here’s How. Visit www.wethefuture.org to learn more about what we’re building, and sign up for updates. In 2013, I left the political world to join a 100-person ridesharing startup that put pink mustaches on the grills of cars. Since then, Lyft has grown into a $5.5 billion business with millions of users. After 3.5 years of crazy growth, I’m leaving Lyft to get back to my roots in political organizing. When you see something that’s broken, and you’re capable of fixing it, you sure as hell better try. There are a lot of things broken with politics today, but there is one thing in particular that bothers me: Young people don’t have a voice. On November 9, millions of young people woke up to a terrifying reality: Donald Trump, who received only 37% of the youth vote, is our next president. 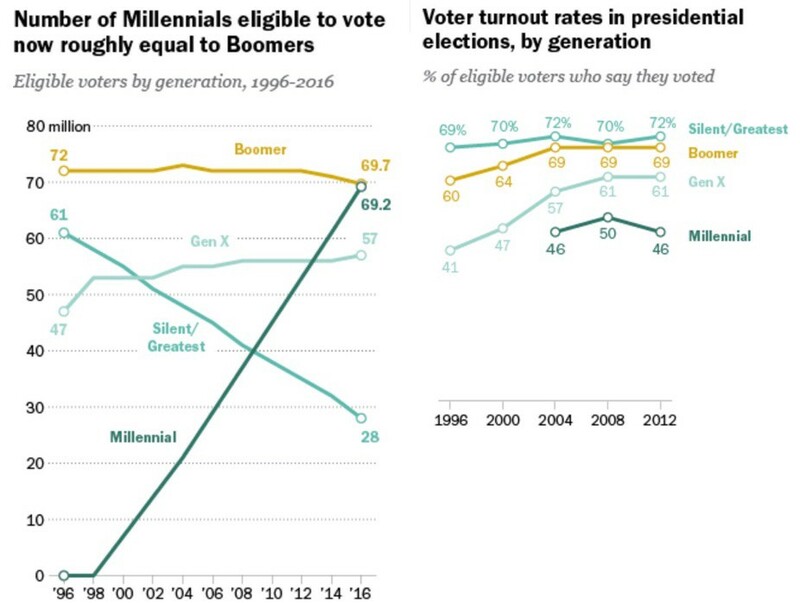 What many people don’t realize is that Millennials (ages 18–35) are now tied with Baby Boomers (ages 52–70) as the largest generation of eligible voters in the country. But while Millennials and Boomers both represent 31% of eligible voters, young people have only a fraction of the political power that our parents hold. Why Aren’t Young People More Engaged? There are a lot of different factors that have historically contributed to low young voter turnout. Young people move around a lot, so we are less invested in local politics and need to re-register to vote multiple times. We are also new to civic participation (and receive minimal education on the subject), so we don’t understand the nuances of how voting works, when different elections happen, or why it’s important. But for young people today, low civic engagement is about more than just geography and education. We were raised in the age of extreme polarization and partisan gridlock. And the result, unsurprisingly, is a generation with extremely low trust in institutions and politics. It shouldn’t surprise anyone that young people are less politically engaged. The organizations that are trying to earn our vote — and fundraising dollars — haven’t evolved in decades, and their outdated approach to political organizing has left them out of touch with young voters. The culture in politics and government tends to be bureaucratic, hierarchical, and risk-averse. These conditions provide significant barriers to innovation from within. Politics lacks the financial incentives to attract attention from the entrepreneurs and venture capitalists who have fueled the disruption of other industries. Political organizations have been slowly adopting new technologies and tactics over the last decade (social media, email marketing, analytics), but the impact on youth engagement has been marginal. Applying new technologies to a decades-old model of political organizing is like taxi companies installing credit card machines and calling it innovation. At the end of the day, this election cycle represented more of the same campaign strategies we always see. Democrats and Republicans collectively spent over $2 billion on the election, yet only 30% of young people say they were contacted directly by a campaign. Most of the campaign money was spent on expensive TV ads that have a questionable impact. Same people. Same tactics. Same results. It’s time for a different approach to political organizing and campaigning. We need to unleash the full political power of young people in order to change our broken government, and we need a new type of political organization to accomplish that. Our mission is to build a massive grassroots movement of young people whom we can mobilize to win elections and pass legislation that aligns with our values. Initially, our organization will focus on 3 core values, which are supported by the majority of young Americans, and cut across party lines. Civil Rights & Social Justice — All Americans, regardless of race, religion, gender, or sexual orientation, deserve an equal shot at the American dream. We have made great progress towards making our country more equitable and just, but we still have a long way to go. Good Governance & Democracy — Our political system & governing institutions are in serious need of an upgrade. If we want a government that truly works for all Americans, we need to reform the current system that empowers corporations & the wealthy over average Americans. Sustainability & Responsibility — It’s time for politicians to stop prioritizing their own short-term political interests over our long-term security & prosperity. Climate change is real, and our generation is going to pay the price for continued inaction. For the next two years, our organization will be focused on the 2018 Midterms, which will be the most important election of our lifetime. We are setting very aggressive goals for 2018, and we’ll need your help to achieve them. Acquire new members → We need to build a powerful engine of viral growth, where every new member is motivated and incentivized to refer other friends to the movement. Keep members actively engaged → We need to cultivate passionate communities — both online and offline — where our supporters can connect with each other, discuss issues, and get organized at the national and local levels. Mobilize members to increase voter turnout → We need to develop training, tools, and technologies that empower our members to increase voter turnout by tapping into their social networks and local communities. First of all, I’m not going to pull this off. We’re going to pull this off. And it’s not as impossible as you think. Young people feel powerless today because we’ve always been taught that we had to play the political game by the old rules, just like everybody else. But we were never going to win that way. We could never compete in the big-money political arena by hosting black-tie fundraisers and spending millions of dollars on TV ads. Instead, we must lean into our competitive advantage: We are the generation of technological innovation. We were raised in the internet age, and we understand how to wield the power of that technology better than anyone else. If small tech startups can face off against multi-billion dollar corporations and disrupt the world’s largest industries, we can do the same to politics. Our top priority right now is launching a crowdfunding campaign in February/March to raise initial seed funding, gather feedback from real people, and validate our core hypotheses about what young people want from a political organization. Sign up here if you want to get involved as an advisor, employee, or volunteer, and visit www.wethefuture.org to get updates on our crowdfunding campaign. You can also follow me on Twitter for more updates (and random tweets). We have a lot of work to do over the next 2 years, but I couldn’t be more excited for or optimistic about what we can accomplish together. And if you’re still unconvinced about my feasibility argument, remember…. Founder & President at We the Future (wethefuture.org). Growth marketer, community builder, and politico. Formerly at Lyft, Obama for America, and Capitol Hill.